When I dive into a salad, I want it to be fully loaded with crunchy crisp things, creamy things, salty things, sweet things…basically all the things. No limp lettuce with disappointing dressing for this chick. Salads get a bad rep because more often than not, they aren’t satisfying. They’re boring. They’re not a meal. They’re…dare I say….WIMPY. But a salad is such a magical foundation of health for just about anything. I mean it’s basically a sandwich without the bread. Pasta without the noodles. K I went overboard. The point is that salads need oomph. Just like you wouldn’t want a sandwich that’s only bread or noodles with a boring sauce, you most definitely aren’t going to run home to your refrigerator to whip up a salad unless it’s balanced, delish, and exciting. Correct? Correct. So play with different textures and flavors! Add color. Add contrast. 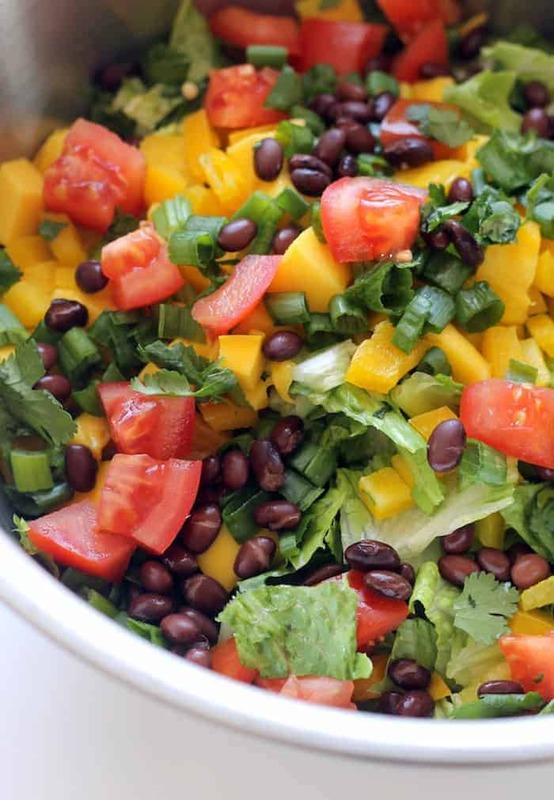 You may not have thought of putting mango in this salad or a touch of maple syrup in the savory dressing, but you wouldn’t believe what a touch of sweetness does to balance out the palate. The sweet mango, crunchy bell peppers, protein-packed beans, tangy hummus dressing (how fun is that? 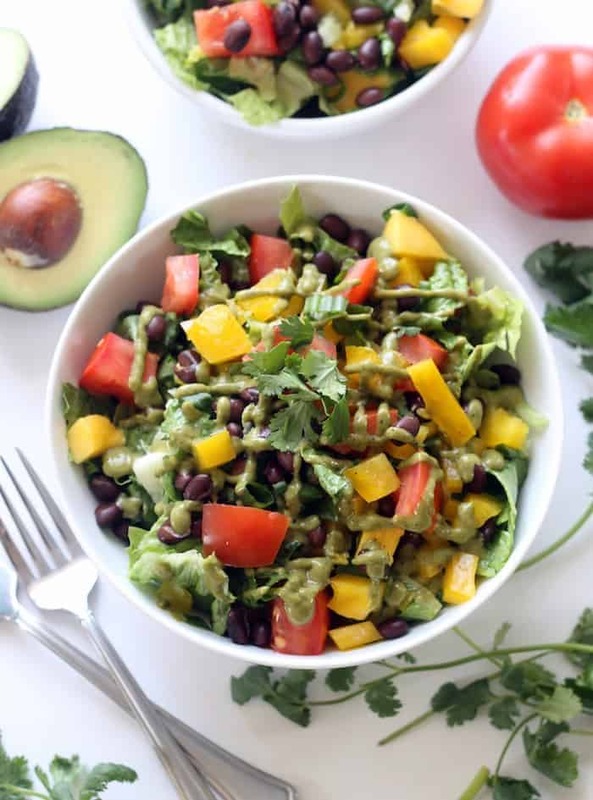 ), and creamy avocado come together to create a seriously delectable salad that’s actually…wait for it…CRAVEABLE. Lettuce chat (pun intended) about what sparked the idea of this sensational salad. 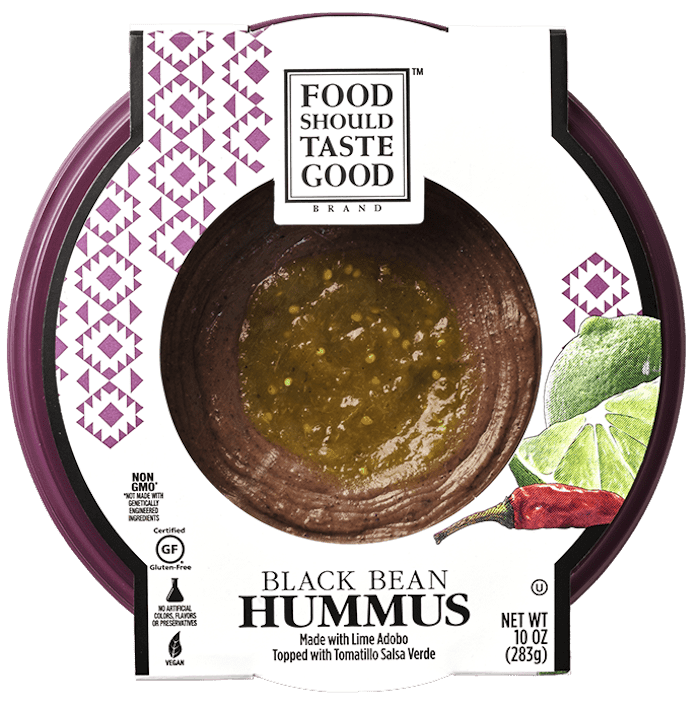 Food Should Taste Good (which you probably know from their yumtastical chips) just released a new collection of hummus that is so gosh darn packed with flavor and creaminess that I honestly almost (I just wrote almond instead of almost) can’t handle it. Between the spot-on unique flavors and the super smooth texture, I don’t know what’s more remarkable about it—the flavah flave or the consistency. I think it’s a tie. The Black Bean Hummus is made with lime adobo and topped with tomatillo salsa verde, so naturally as soon as I tasted it, I knew it was destined to be turned into a dressing for Mexican-inspired chopped salad. Duh, right? There are a bunch of intriguing flavors, but my favorite to eat straight up was hands down the Chickpea Lentil Hummus made with vindaloo curry and topped with mint chutney. What makes this hummus difference from other hummus I’ve tried is the unique flavor blends. We’re not talking garlic or roasted red pepper. We’re talking innovative add-ins like curry, ginger, togarashi spice, edamame, Herbs de Provence, and caramelized onions. I mean are you drooling yet?! I kind of went to town on these. Then I went so far as to crumble their new Pinto Bean Multigrain Bean Chips on top of this very salad for crunchy saltiness (don’t fall out of your chair) I was just like….OMG DEAD. 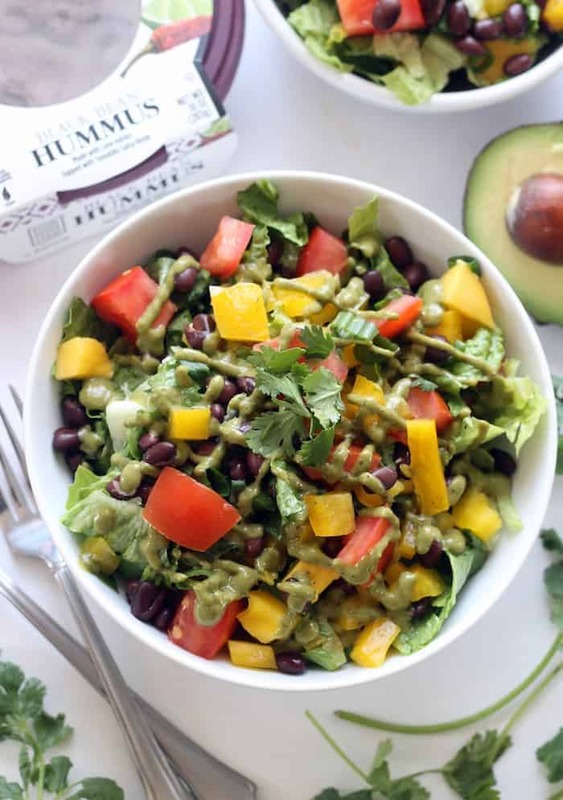 This refreshing salad is packed with flavor, fiber, and crunch from the crisp mango, black beans, peppers, tomatoes, and a creamy avocado hummus dressing. Place the salad ingredients in a large bowl. Toss to combine. If serving immediately, add dressing and toss to combine. If saving some for later, place salad in serving bowls and top with desired amount of dressing. This post is sponsored by Food Should Taste Good. Be sure to check out their website and follow along on Facebook, Twitter, and Instagram, too! Thanks for supporting the brands that make Hummusapien possible! This looks so bright and fresh- and delicious! I’m so ready for salad season and lots of fresh produce. OMG — GOR-geous……can’t wait to make this!!! This is legit my go-to salad/dinner. I always seem to have these ingredients on-hand! That hummus sounds amazeballs and I need it asap. 1 salad to-go plz thx. salad can be a total meal material..i think its all about crunch and taste that needs to be in the spotlight :) i have not tried this brand of hummus..but if hummus queen is recommending it, i know its stellar! that is the very reason i LOVE mexican salads. there is always a ton of toppings on there. This salad looks amazing and the dressing is a must try. Thank you for sharing. Looks delicious!! Where can I find the hummus? That dressing sounds incredible! I love Food Should Taste Good, so I’m definitely trying it out asap! Gimme all the Mexican things! Loving all the colors and textures here. I say the more things on a salad, the better. Also need that hummus ASAP!!!! Holy Goodness! Another wonderful salad idea that I am excited to make for lunch this week. Thank you! !